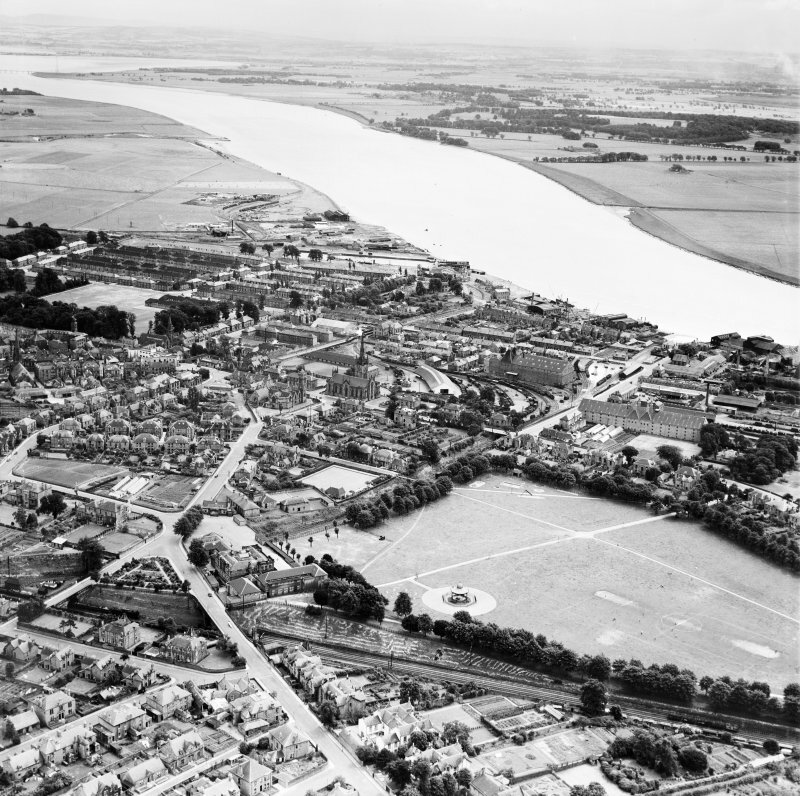 Alloa, general view, showing St Mungo's Parish Church, Bedford Place and West End Park. Oblique aerial photograph taken facing east. 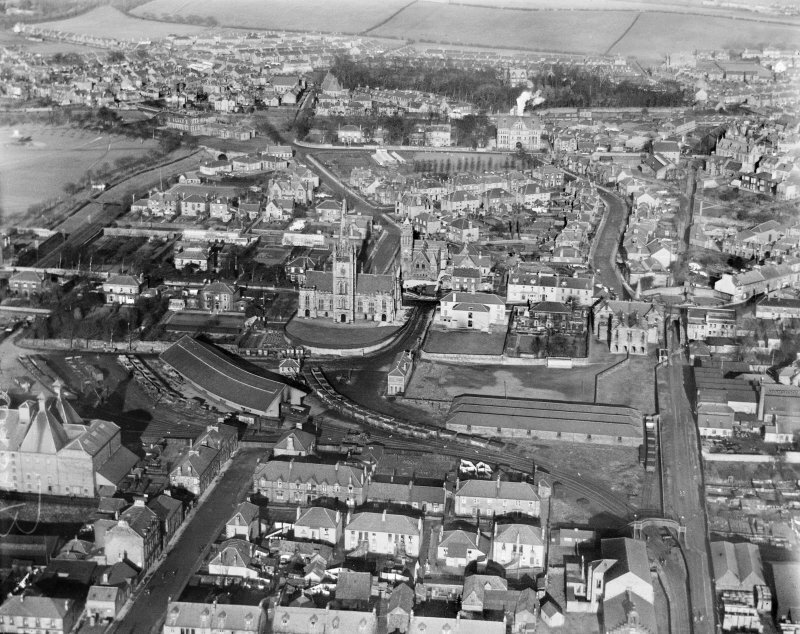 Oblique aerial view of Alloa West Church and St Mungo's Parish Church, taken from the NE. 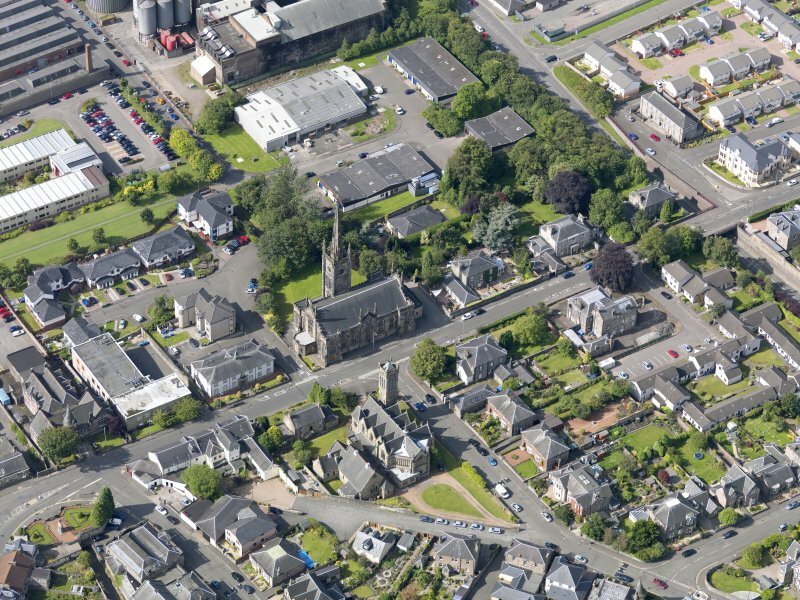 Alloa, general view, showing St Mungo's Parish Church, Town Hall and Ludgate. Oblique aerial photograph taken facing north. 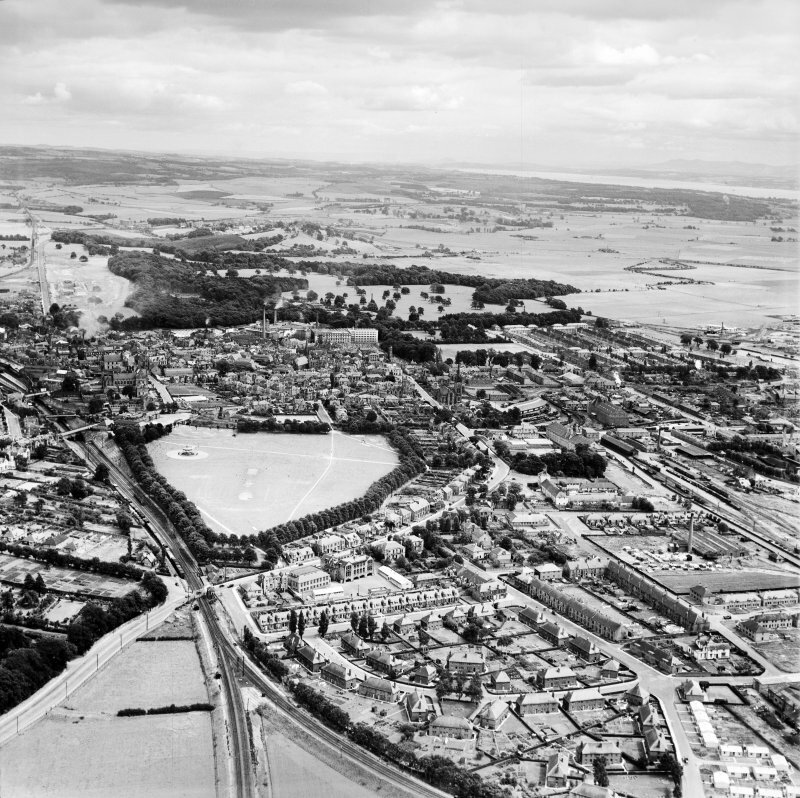 Alloa, general view, showing St Mungo's Parish Church, Bedford Place and West End Park. Oblique aerial photograph taken facing south. 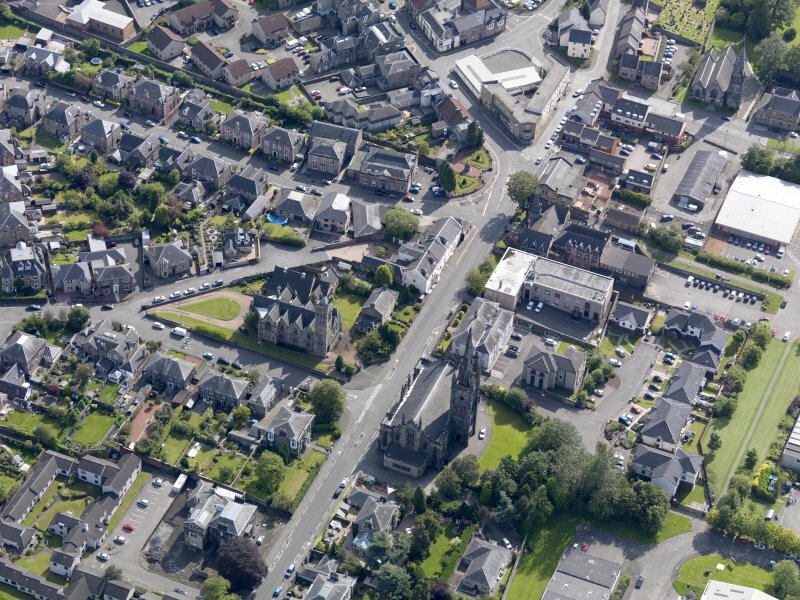 Oblique aerial view of Alloa West Church and St Mungo's Parish Church, taken from the WSW. 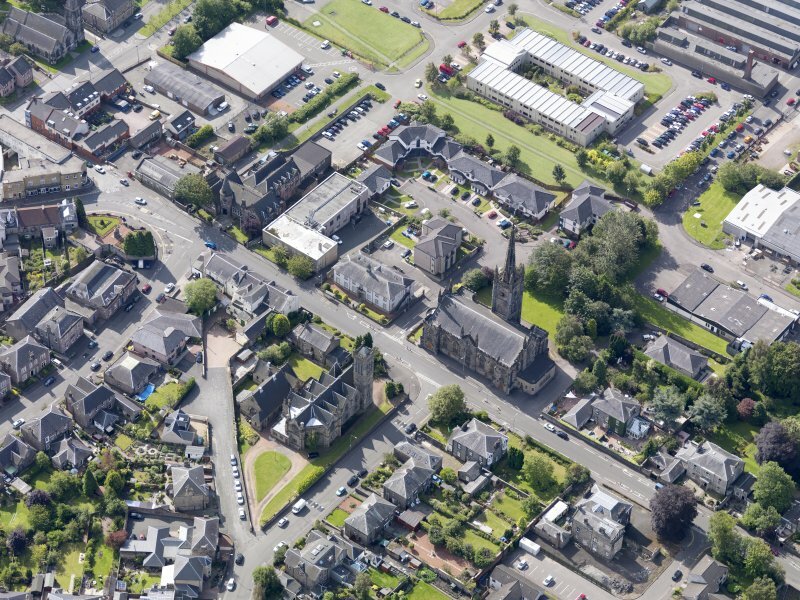 Oblique aerial view of Alloa West Church and St Mungo's Parish Church, taken from the NNW. 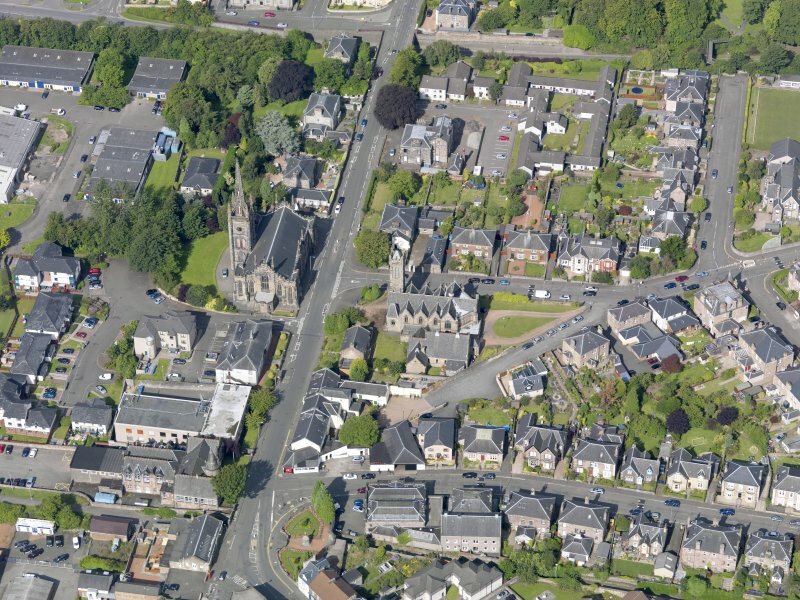 Oblique aerial view of Alloa West Church and St Mungo's Parish Church, taken from the E.
He complains of the heavy burden laid upon him by the building of both Kirks. *The Clackmannan is nearly finished. *The Alloa is 10' above the base. Addition of a spire to the embattled tower of the new kirk. Letter from the Earl of Mar to John F M Erskine. He considers that it will add greatly to the view from Stirling Castle and thinks the spire bears some resemblance to that of the Cathedral at Norwich. New pulpit for the Kirk. Payments included in account of intromissions 1682-94 by John Keirie with sums owed to deceased lady Areskine and to the Earl of Mar her heir. Rebuilding of Family vault. To have a "few Gothic Lance windows" Entrance to remain Eastward Door to correspond properly with the building. Two family arms to be in separate shields. 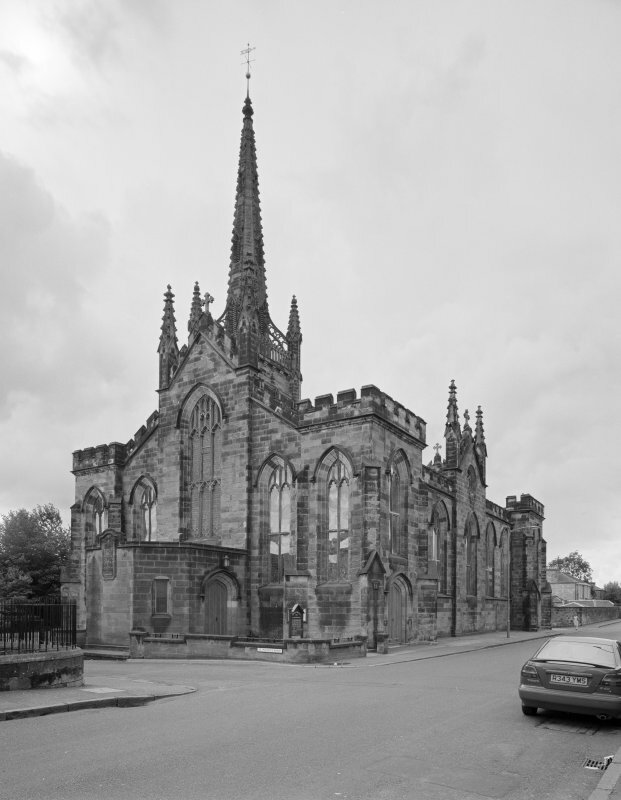 Financing of building of New Kirk. Financing the building of the new Kirk. Letter from the Earl of Mar to John F.M. Erskine. The contract is for 4,900 [pounds] but heritors have only contributed 3,700 [pounds]. The 2 Kirks are a very heavy load on men these disastrous times. The Clackmannan is very near finished and the walls of the Alloa one are fully 10' above the base. I wish we could defer the completing of this for a little time but that is impossible. Letter E. of Mar. to John E.M. Erskine. Proposed new Church at Alloa. Letter from the Earl of Mar concerns the 'Town People' appreciation of * Mr. Gillespie [Graham's] plan which he describeds as a handsome one. 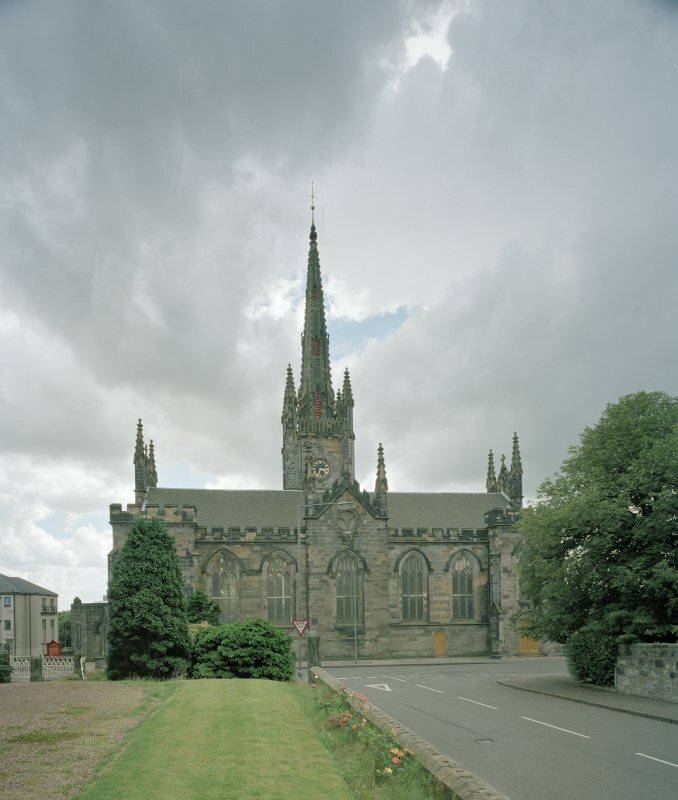 The provision of a new Clock and Bell for Alloa Steeple. Note of payment to Ramsay Traquair of Lord Abercromby's proportion of the cost. Alterations to the doors of Alloa Church. Note of payment of the Earl of Mar's proportion of the cost. Letter from John Francis Erskine, latterly Earl of Mar, to John F M Erskine. He writes concerning the problem of erecting a dignified piece of worship. The contract is for a building costing 4,900 [pounds] but the Heritors have only contributed 3,700 [pounds]. Laying the New Church of Alloa with pavement to prevent dry rot. Note of payment of 67.0.4 [pounds] as the Earl of Mar's proportion of the cost. Burden of the expense of building the two Kirks. Repair of the Old Steeple of Alloa. Payment of Lord Abercromby's proportion of the cost. Alterations to enlarge the Church. Obligation by Heritors and Kirk Session of Alloa to grant a new right of seats to the subscribers. New pulpit and silver Communion basin for Alloa Church. Cost included in account of intromissions 1682-1694 by John Keirie with sums owed to deceased Lady Erskine and to the Earl of Mar her heir.